This view shows the patch of veined, flat-lying rock selected as the first drilling site for NASA's Mars rover Curiosity. Image released Jan. 15, 2013. NASA's Mars rover Curiosity is preparing to drill into a Red Planet rock for the first time and delve deeper into a site that was exposed to liquid water long ago, scientists announced today (Jan. 15). Over the next two weeks, the 1-ton Curiosity rover will drill a rock in an outcrop that scientists have christened "John Klein." Evidence is strong that water flowed and percolated through the area in the distant past, researchers said. 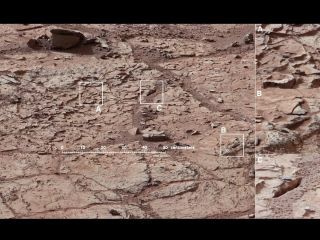 "Basically, these rocks were saturated with water," Curiosity chief scientist John Grotzinger, of Caltech in Pasadena, told reporters during a teleconference. The $2.5 billion rover has spent much of its first five months on the Red Planet testing out its 10 science instruments and other gear, making sure everything is in good working order. The drill — which will allow Curiosity to bore 1 inch (2.5 centimeters) into Martian rock, deeper than any robot has gone before — is the last major tool to check out. The mission team wanted to find a suitably intriguing site for the first drilling operation, and they say John Klein fits the bill. The outcrop, which was named after a former Curiosity deputy project manager who died in 2011, is part of a geologically diverse site with many water-related features. For example, the area is shot through with light-colored mineral veins similar to the one spotted by Curiosity's smaller cousin Opportunity a year or so ago in another part of the Red Planet. "On Earth, forming veins like these requires water circulating in fractures," Nicolas Mangold of the University of Nantes in France, a team member for Curiosity's ChemCam instrument, said in a statement. Further, a nearby outcrop called Shaler harbors evidence of sediment transport. Some of Shaler's grains are too big to have been moved by wind, suggesting that liquid water pushed them along, researchers said. That's not terribly surprising, as Curiosity has already rolled through a streambed that once flowed with ankle-deep water in the ancient past. The geological diversity of the John Klein area, and its potential to shed light on Mars' wetter and warmer past, have mission scientists excited. "This is, I would guess, at least as complex a history for the involvement of water that we've seen anywhere on Mars so far," Grotzinger said. "The main goal of this [drilling operation] is to try to assess this material in a very general way that will give us an appraisal of the habitability of this environment." This image of an outcrop at the "Sheepbed" locality, taken by NASA's Curiosity Mars rover with its right Mast Camera (Mastcam), shows show well-defined veins filled with whitish minerals, interpreted as calcium sulfate. Image released Jan. 15, 2013. Curiosity is just a few meters away from the John Klein outcrop at the moment. In the coming days, the rover team will select a particular section of the outcrop for drilling, and the first hole should be bored within two weeks or so, researchers said. "It's really the most difficult aspect of the surface mission," said Curiosity project manager Richard Cook, of NASA's Jet Propulsion Laboratory in Pasadena. "We're undoubtedly going to learn a lot about how to drill things on Mars, as it's the first time we've ever done that. And so we will probably go slowly." Mission scientists have waited more than five months to try out the rover's drill on Mars, and they're eager to see what the tool can do. "We're thrilled, and we can't wait to get drilling on this stuff," Grotzinger said.